A Very Fine French 19th Century Gilt-Bronze Mounted Kingwood and Gilt-Bronze (Ormolu) Mounted Basket Woven Parquetry Folding Table Étagère, by François Linke (1855-1946) Index number 121. The removable étagère inlaid with a basket woven parquetry within boxwood and ebony veneers, supported on a folding x-shaped support, one handle has been removed to reveal the mark FL from the bronze master model. Circa: Paris, 1889-1902. Linke title: Table à thé Louis XV en bois de violette et en bois de palissandre vernis. It is difficult to establish exactly when Linke first made this model. The first clear indication is seen in a line drawing in Daybook 5, with chasing carried out on March 8, 1889. The blue and the green registers have the same details indicating that the work on the blue book was simply transferred to the more substantial green folios kept by a clerk rather than Linke himself. This last model was made by Schmitt with mosaïque by Labbé. The eight 'frlatines'(?) were made by Linke's brother Clément for 1francs 60 centimes. Footnote courtesy of Christopher Payne. François Linke (1855-1946) born in Pankraz, Bohemia, is considered by many as the greatest Parisian cabinetmaker of his day, at a time when the worldwide influence of French fashion was at its height. The ancien régime has always been the greatest source of inspiration for artistic design in France and, influenced amongst others by the de Goncourt brothers, the Louis XV and Louis XVI styles were revived to wide popular appeal. During the Second Empire these styles were so eclectic that they became debased. Linke wanted to create a fresh new style and his association with the enigmatic sculptor Léon Messagé resulted in a highly original series of designs, based on the rococo style fused with the latest fashion in Paris, l’art nouveau. This style, known as le style Linke, was received with critical acclaim at the 1900 exhibition and remains popular today amongst the worldwide clientele for Linke’s exquisitely made furniture. The book, with 140,000 words of text and over 700 photographs, many previously unpublished and drawn from Linke’s own archive and private collections, has ten chapters showing the development of this exacting and prolific man’s life work. It traces his early life and apprenticeship and his comfortable family life in Paris, culminating with the award of the Légion d’honneur. Appendices on Metalwork and Wood add to the technical expertise of this book, giving a unique insight into the workings of any cabinetmakers recorded to date. 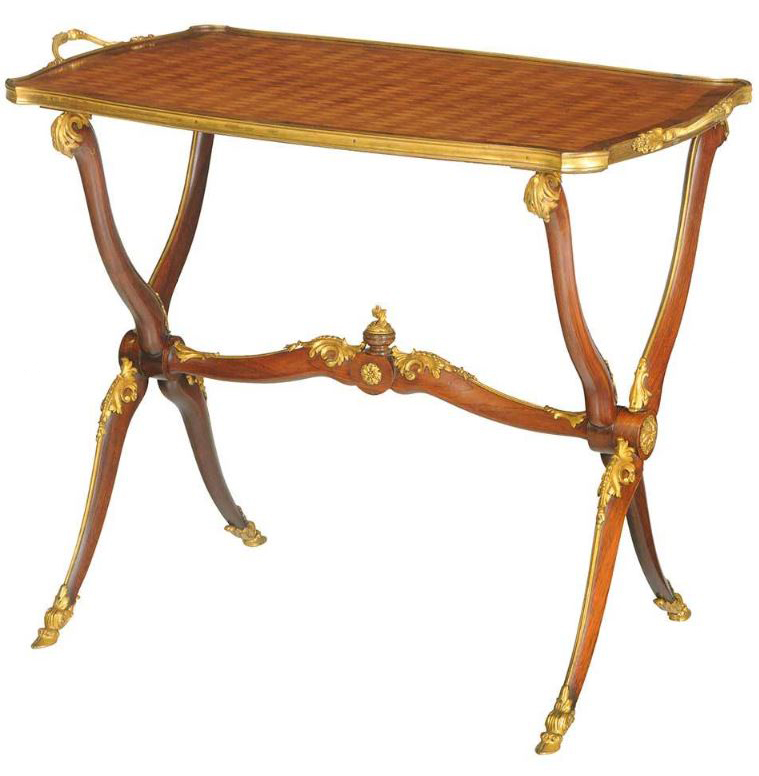 A Very Fine French 19th Century Gilt-Bronze Mounted Kingwood and Gilt-Bronze (Ormolu) Mounted Basket Woven Parquetry Folding Table Étagère, by François Linke (1855-1946) Index number 121. The removable étagère inlaid with a basket woven parquetry within boxwood and ebony veneers, supported on a folding x-shaped support, one handle has been removed to reveal the mark FL from the bronze master model. Circa: Paris, 1889-1902. It is difficult to establish exactly when Linke first made this model. The first clear indication is seen in a line drawing in Daybook 5, with chasing carried out on March 8, 1889. The blue and the green registers have the same details indicating that the work on the blue book was simply transferred to the more substantial green folios kept by a clerk rather than Linke himself. This last model was made by Schmitt with mosaïque by Labbé. The eight 'frlatines'(?) were made by Linke's brother Clément for 1francs 60 centimes. Footnote courtesy of Christopher Payne. François Linke (1855-1946) born in Pankraz, Bohemia, is considered by many as the greatest Parisian cabinetmaker of his day, at a time when the worldwide influence of French fashion was at its height. 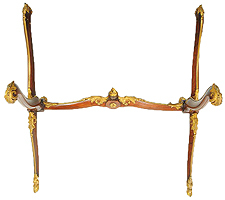 The ancien régime has always been the greatest source of inspiration for artistic design in France and, influenced amongst others by the de Goncourt brothers, the Louis XV and Louis XVI styles were revived to wide popular appeal. During the Second Empire these styles were so eclectic that they became debased. Linke wanted to create a fresh new style and his association with the enigmatic sculptor Léon Messagé resulted in a highly original series of designs, based on the rococo style fused with the latest fashion in Paris, l’art nouveau. This style, known as le style Linke, was received with critical acclaim at the 1900 exhibition and remains popular today amongst the worldwide clientele for Linke’s exquisitely made furniture. The book, with 140,000 words of text and over 700 photographs, many previously unpublished and drawn from Linke’s own archive and private collections, has ten chapters showing the development of this exacting and prolific man’s life work. It traces his early life and apprenticeship and his comfortable family life in Paris, culminating with the award of the Légion d’honneur. Appendices on Metalwork and Wood add to the technical expertise of this book, giving a unique insight into the workings of any cabinetmakers recorded to date. Jan's & Co. Fine French Antiques, Inc. wishes to thank Mr. Christopher Payne for allowing us to publish his biography as well as all the above information about François Linke.